Pony Tales Blog: Pony playtime with friends! 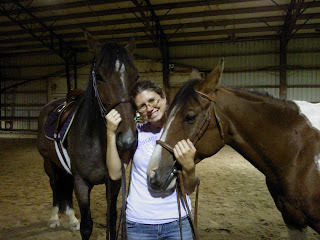 My friends, H. and B., and I went to the barn tonight for a little pony playtime. H. boards her horse at my barn -- in fact, Rondo used to be in the same corral with Freckles -- but B. has her two horses elsewhere, so we traded off between my two boys and Freckles. Rondo lost a shoe on Thursday so we really didn't do much with him, and the only reason we rode him at all is because the footing in the indoor arena is pretty soft. He seems perhaps a touch reluctant but I don't think he was terribly sore or I wouldn't have ridden him. We mostly just walked and trotted him, with a little bit of cantering. 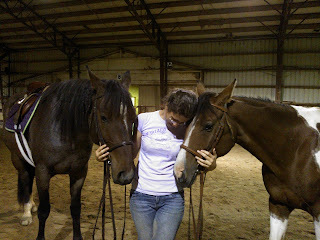 B. rode both of my boys, and they both did well for having a stranger riding them. Panama still seems to be doing well, but by the time we stopped riding he was no longer picking up the canter immediately when asked. I am hoping he was just tired, as we had been riding a long time. H. doesn't really ride, so Rondo got to hang out in the middle of the arena with her and snooze while B. rode Freckles for her. Freckles is overweight from too little riding and too much mix hay (Rondo was pretty tubby when he was in that corral too) so he can especially use the exercise. I didn't ride him, so I just hopped back on Panama for a bit. We all had a pretty good time. It was nice to ride three days in a row, and even nicer to have such a fun time riding with friends! Also a full-time freelance writer, Katharine Swan unexpectedly became a horse owner 3 years ago when she and her husband rescued 11-month-old Panama from abusive "backyard breeders." They live in Denver, Colorado. Content copyright © 2008-2011 by Katharine Swan Leppert. No part of the work displayed on this site may be reproduced without the author's express permission.